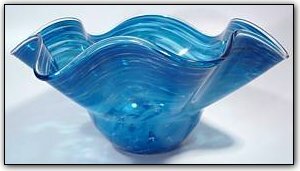 This fluted bowl features shades of enchanting ocean blues and aquamarines, along with an elegant clear lip wrap. This bowl is also quite heavy, making it a perfect vessel for a fruit bowl or other decorative displays. Make sure to zoom in to see the intricate manner of the different shades interacting with each other, and they're even more mesmerizing in person!